In general, I am a cynic and a nihilist. That means when reviewing the literature, I find most glasses half empty rather than half full (OK, probably this is true in life, but that is TMI). I am very unlikely to try a new treatment based on one study. For every rule, however, there is an exception. 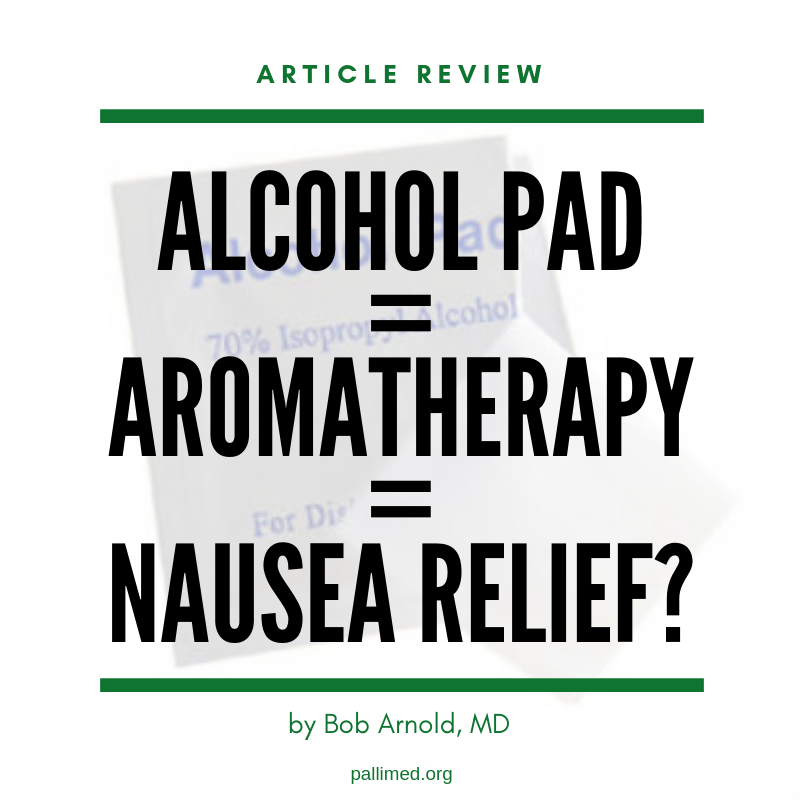 I am completely enthralled with aromatherapy and thus found an article in the Annals of Emergency Medicine by Beadle on isopropyl alcohol nasal inhalation for nausea in the emergency department. It was a randomized controlled trial which made it swoon-worthy. The only problem was it was a placebo trial and so my friend(s) pooh-poohed the article. I was thrilled to see the follow-up, double-blind RTC article by April: “Aromatherapy Versus Oral Ondansetron for Antiemetic Therapy Among Adult Emergency Department Patients: A Randomized Controlled Trial,” in February 2018, again in the Annals of Emergency Medicine. The fact that it was positive means that anyone who I talk to has to hear about it (as well as how they must watch Nanette and how excited I am about the new season of The Good Place). The aim of the 2018 study was to compare nasally inhaled isopropyl alcohol versus oral ondansetron (aka Zofran) for the treatment of nausea among emergency medicine patients. They looked at 120 adult patients with nausea or vomiting who did not require an IV. The patients who were randomized into the three groups: (1) isopropyl alcohol plus 4 mg of oral ondansetron; (2) isopropyl alcohol plus oral placebo; (3) inhale saline plus 4 mg of ondansetron. (They did not do a double placebo because there is placebo-controlled data that both drugs work). The isopropyl alcohol was a commercially prepared, medical pad placed 1-2 cm from the patient’s nose and the patient was instructed to nasally breathe to inhale the isopropyl alcohol. Measurements were made at 10, 20, 30, and 60 minutes and then hourly until disposition using a 0-10 cm visual, analog scale. Mean nausea scores decreased 30 mm in the alcohol and ondansetron group, 32 mg in the alcohol placebo group, and 9 mm in the saline ondansetron group (this was statistically different). 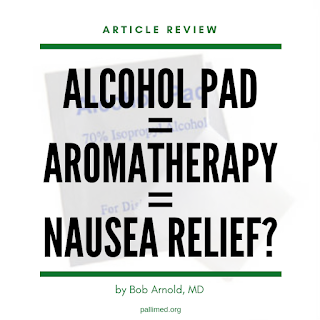 Patients in the isopropyl alcohol groups also had better nausea control at the time of discharge and higher satisfaction with no adverse events. The assignment of patients to treatment was evenly randomized. All of the patients who entered the study were accounted for at the conclusion and there was complete follow-up. They asked the patients and clinicians if they could tell what group they were in (they could not). The patients seemed to be treated in an identical manner. Rescue antiemetics were less common in the groups who got the isopropyl alcohol versus the ondansetron alone. Were the results clinically important? The investigators used 20 mm as a clinically significant result, which seemed to be reasonable. They did not make any adjustment for compounding variables, but I really was not sure what the confounding variables should be; this seemed reasonable. The problem with the study is the question whether the results will help me care for my patients. My patients are not young, relatively, healthy individuals with viral illnesses who do not need an IV. That is unclear and if I am being my normal, cynical self, I probably should just move on! On the other hand, given that this trial has absolutely no side effects and I can carry alcohol swabs around in my coat, I stick with my love of this article. I mean seriously, why wouldn’t you try this in the hospital on patients with nausea and vomiting. So, I am going to urge you to watch Nanette, the Good Place and carry around isopropyl alcohol swabs in your pocket on rounds. Tell me if you think I am wrong! Robert Arnold, MD is a palliative care doctor at the University of Pittsburgh and a co-founder of VitalTalk (@VitalTalk). He loves both high and low brow comedy (The Good Place and Nanette), pop culture (the National Enquirer and Pop Culture Happy hour) and music of all kinds (not opera tho!) You can find him on Twitter at @rabob. More Pallimed posts from Bob Arnold can be found here. More journal article reviews can be found here. More posts on nausea can be found here. Hines S, Steels E, Chang A, et al. Aromatherapy for treatment of postoperative nausea and vomiting. Cochrane Database Syst Rev. 2012;(4):CD007598. From these first steps began a truly humbling and inspiring journey across many continents and into many communities. Much of this started when a project I was involved with – Education in Palliative and End of Life Care for Pediatrics* (EPECPeds) – launched. The larger world was very interested in a flexible, curriculum to scale pediatric palliative care services. Groups from India, South America, the Pacific Rim, and an Isreali-Palestinian initiative among others invited us to teach and most importantly to train others to teach. When I travel I also look up palliative care friends I have met along the byways and see what their work is like. From these travels and workshops, relationships formed. Lively discussions erupted. What does pediatric palliative care look like in other countries? How has it evolved? What are the lessons learned to help, and ones to avoid? As a social worker, people usually ask me about mental health, psychosocial and bereavement support considerations. These are especially tough questions when one knows little of the cultural context, perceptions of, and approaches to mental health, or the resources available to address the needs. In India, the first question families are asked when a new diagnosis is made is “how much money do you have?” The second question is “what do you want the patient to know?” Collusion between the physician and the extended family about how much (if anything) to tell the patient, is common and expected. It is important to account for and adjust to these differences. But some things are universal. I was recently in Singapore, working with a pediatric palliative care team. On several home visits, I saw devoted families providing exquisite loving care. International work can leave haunting memories too. In the aftermath of Hurricane Haiyan, in the Philippines, I volunteered near the community health center’s “intensive” care unit for the sickest patients. This small room with dirty green walls and sputtering florescent light held two narrow cots and a gurney, a large rusty O2 tank, and a cabinet. I observed a girl no older than 13 handbagging an elderly man lying on a gurney. In the other corner, an elderly person was huddled against the edge of a cot, hopefully sleeping. As I peeked into the room, the girl turned to me with an expression of great anxiety and distress. She did not break rhythm in her bagging task. I asked the physician about the scene, who explained that family members often must provide such care as no other resources exist. She expected this elderly cancer patient would die within a few days. I asked about discussing a do not resuscitate order or advanced care planning. She said no, that would happen with the oncologist at the regional cancer center…3 hours away. All I could hope for was that the grandfather wouldn’t die during this young girl’s shift at the bedside. 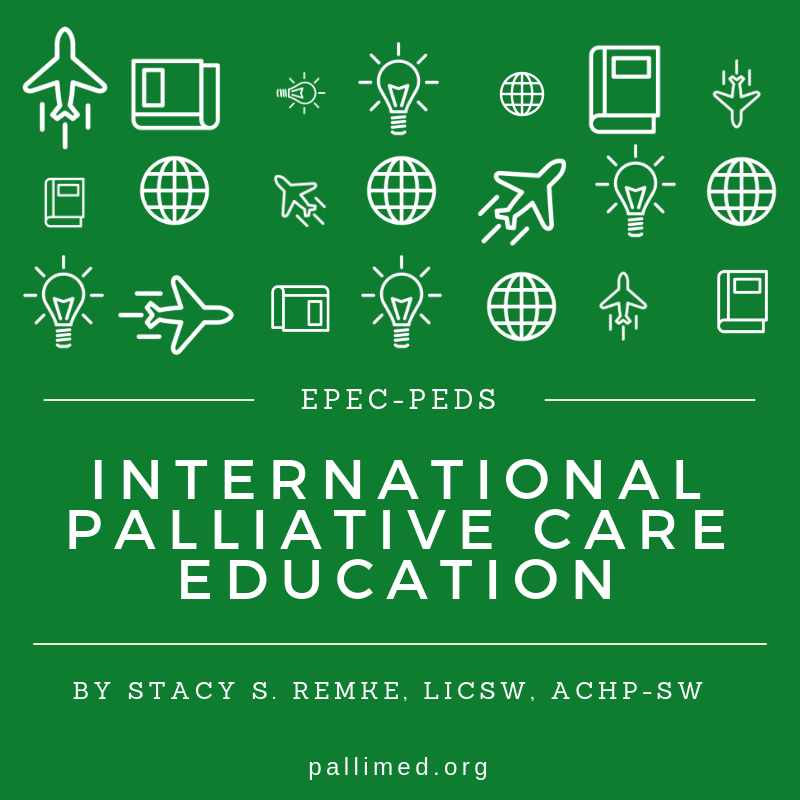 These international adventures in palliative care can be enriching and maddening all at once and are likely to change us in ways we do not expect. For me, I no longer take for granted the tremendous resources and access people have here in developed countries. Routine illnesses here are life-threatening in other places. What then are the boundaries of palliative care? We apparently can’t take suitcases of morphine to places where supplies are restricted. (I asked!) What can we do then to improve a lot of those living with pain? As a start, make some friends. Go and visit them. Witness love, skill and dedication in action. Be humble. See what you can offer. By the way, we never did crack North Dakota in our initial pilot effort, but other doors opened. Join the palliative care community and see the world, indeed! 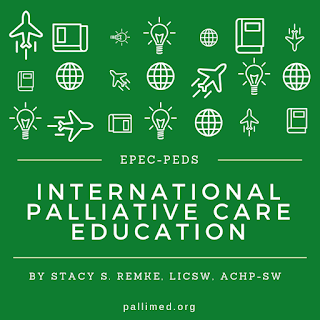 Stacy S. Remke, LICSW, ACHP-SW was a pediatric palliative care social worker for over 27 years and one of the founders of PPC at Children's Hospitals and Clinics of MN. She currently teaches graduate social work at the University of Minnesota, hoping to inspire the next gen palliative care social work community. She is also on the board of SWHPN. When not occupied with all things palliative Stacy can be found wrangling her 108 lb "puppy" Seamus. Good things come in threes. I was on service this week and saw a patient with Lewy Body dementia in the emergency room after he fell and broke his hip. His niece was his surrogate and trying to decide what to do. She asked me whether he should have his hip repaired. In looking through the literature I came across Sarah Berry’s article “Association of Clinical Outcomes of Surgical Repair of Hip Fractures versus Nonsurgical Management in Nursing Home Residents with Advanced Dementia”. Even better, there was an editorial in the same issue of JAMA Internal Medicine placing the article in context. Second, as I was reading the article, I heard the trauma surgeon talking about the same article with her residents. Finally, this morning I woke up and read Bree Johnston’s fabulous special report in JPM on hip fractures in the setting of limited life expectancy, “The importance of considering goals of care and prognosis”. Yahtzee! (My children would point out that only a true nerd would find this trio of events a cause for celebration). While I would recommend you read both the editorial and Dr. Johnston’s fabulous special report, the purpose of this Pallimed series is to look at the data so I’ll be reviewing Berry’s article. 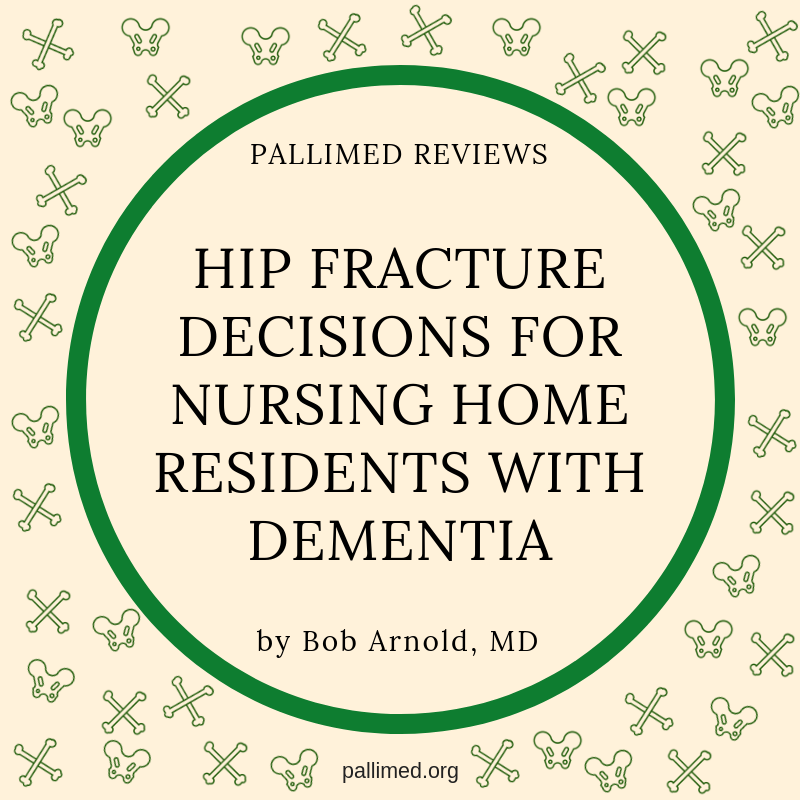 The aim of the article was to assess outcomes for nursing home residents with advanced dementia who did and did not undergo surgical repair of a broken hip. Advanced dementia was defined as a Cognitive Performance Scale (CPS) of 5 or 6 and diagnosis of “dementia” or “Alzheimer disease.” By outcomes they meant survival (the primary outcome), pain, anti-psychotic use, physical restraints, pressure ulcers, and ambulatory status. The authors used the MDS (Minimum Data Set) assessment and linked this to Medicare claims to conduct a cohort study of 3,083 long-staying nursing home residents with advanced dementia and hip fracture. They found, as have other studies of nursing home residents with hip fractures, that patients who underwent surgery had lower mortality rates (the literature stressed the importance of surgery within the first 24 hours). While 35% died within 6 months, and 61% within two years, the mortality was significantly greater in patients who did not have surgery. These results were greatest in the first 30 days; 11% mortality with surgery, 30% without surgery, and resulted in a median survival of 1.4 years with surgery versus 0.4 years if the patient did not undergo surgery. Adjustment attenuated the findings, but they remained significant. Residents who underwent surgical repair also had less pain, less anti-psychotic drug use, physical restraint use and pressure ulcers; although once these results were adjusted for differences between the two groups there were no differences according to surgical repair. 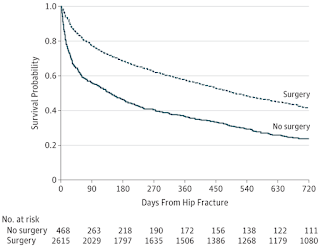 Interestingly the inverse probability of treatment waiting models, which adjusted for differences in characteristics before the hip fractures, suggested that there was less pain and fewer pressure ulcers among patients managed with surgery. (I need someone who knows more about statistics than me to explain why two different ways of statistical correction resulted in different secondary outcomes). 1. Are the patients in this population relevant to the ones I care for? Well, as a hospital-based palliative care doctor these are exactly the kinds of patients for which I am consulted. 2. Are the outcomes that the authors measured the correct ones? Well, it seems to me that pain, survival, and restraints are all things that my patients’ families want to know about. Sadly, for these secondary outcomes they could only look at one point in time. Also, to have data on the secondary outcomes, the patient had to live at least six months (it has to do with when MDS data is collected). Thus, for a lot of the patients we do not have these secondary outcomes. 3. Were the two groups similar in characteristics prior to the operation? Sadly, the answer is no. Residents treated non-operatively were much more impaired at baseline. For example, 26% of the non-operative residents were completely dependent in activities of daily living as opposed to only 5% of the surgical residents. Moreover, despite the large number of variables in the MDS, it is likely there were differences between the two groups that were unmeasured that led the surgeons to choose not to do surgery. In addition, it is unclear whether the decision to do surgery was based on patient/family preferences. Thus, one does not know if the reason for the difference in outcomes was based on surgery or whether other variables led both to the decision to have surgery and the outcomes. This is a limitation of not doing a RCT. Finally, the outcomes could be due to a self-fulfilling hypothesis. Given the non-surgical patients’ greater illness/morbidity, there may have been a decision only to focus on comfort. Given this, the treatment these patients received was less focused on prolonging life and thus they died sooner. (This would have nothing to do with the impact of surgery on survival or clinical outcomes). 4. Were the circumstances and methods for detecting the outcome similar? The answer here is yes. The MDS is a very complete way of detecting the outcomes of interest. Although pain was evaluated by the health care provider rather than the patients, there is no reason to think that there would be differences based on which group they were in. 5. Was follow-up sufficiently complete? Again, the answer seems to be yes, although as previously noted, for patients who did not live six months we do not have any of the secondary outcomes. 6. Are the differences big enough that I should care? Again, the answer is at least with the primary outcome the difference did seem quite large as noted before, the secondary outcomes, differences, particularly after adjustment, are much smaller. So, what does this mean? In the end, as Johnston et al. summarized, the decision to have surgery depends a great deal on the surrogate decision-maker’s view about the patient’s quality of life preoperatively and what is most important postoperatively. I have to say that this article would, for many of my patients, lead me to do surgery and continue aggressive palliative care (the increased rate of ambulation postoperatively -10.7% in the patients with surgery versus 4.8% in those without surgery - would be a big factor for many families). While a randomized controlled file would be better, it is unlikely that one will ever be conducted. 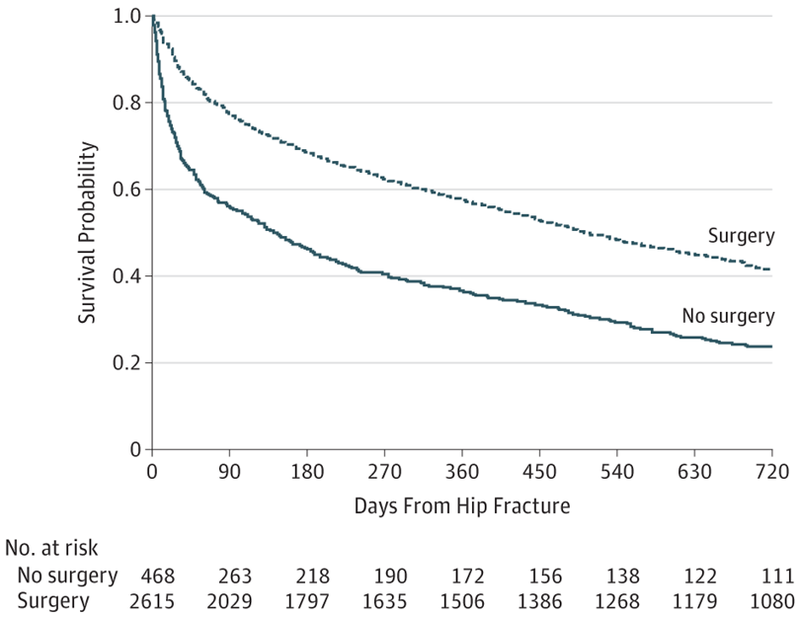 (I am given pause by the mostly negative data presented by Johnston on hip fracture repair. She points out, for example, there is the Cochran review of five randomized controlled trials that shows no difference in medical complications, mortality or long-term pain in conservative care versus surgery. While this is not a study of demented patients, it made me realize the data is controversial). A coda: What I and the editorial found distressing were the high rates of pain and the low rates of hospice in severely demented patients even after they have hip fractures (particularly in the non-operative patients). It also was quite curious that the median time to utilize hospice was 56 days. 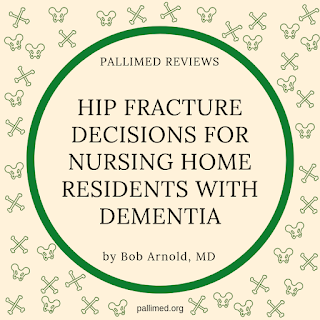 Given this article, I wonder whether hospice should be discussed and/or recommended for all patients who have severe dementia and a hip fracture. This article should lead you to talk to your trauma surgeons and/or orthopedists to develop a routine palliative care or hospice consultation for these patients. More Pallimed posts from Bob Arnold can be found here. More journal article reviews can be found here. 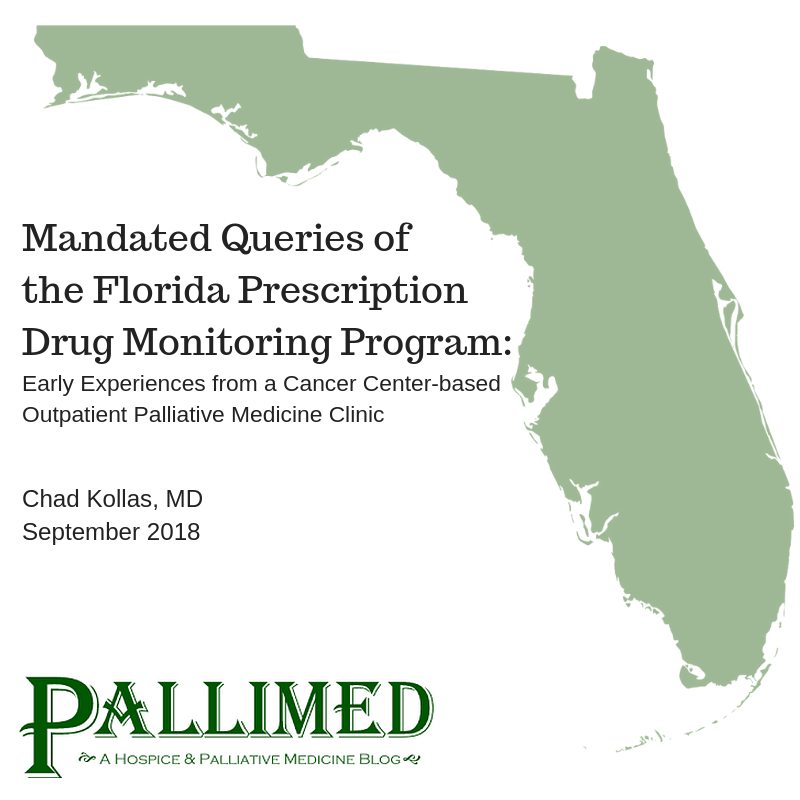 On July 1, 2018, Florida implemented a new law requiring all licensed physicians to query the state’s prescription drug monitoring program (PDMP), known as the Electronic Florida Online Reporting of Controlled Substances Evaluation (E-FORSCE), before prescribing controlled medications, including opioid analgesics. This law evolved from a September 2017 proposal by Governor Rick Scott intended to reduce deaths from Florida’s growing number of opioid overdoses, a trend commonly known as the Opioid Crisis. Gov. Scott’s proposal built upon two recent Florida laws, which were also proposed to combat the Opioid Crisis. The first measure created Florida’s PDMP in 2009, although the program was not funded for operation until September 2011. The second law passed in 2012 and established prescribing rules for managing chronic pain and highly regulated free-standing pain management clinics (Lenchus JD, Opioids and Controlled Substances. FMA Controlled Substance Prescribing Course, 2018). While these laws eventually resulted in the elimination of Florida’s rogue Pain Clinics, known commonly as “Pill Mills,” they unintentionally increased opioid stigma and made it more difficult for cancer patients to obtain controlled pain medications (Kollas CD, Boyer-Kollas B. J Pain Symptom Management, February 2018;55(2):663-4). In April 2018, the Florida legislature broadened Gov. Scott’s original proposal to include almost all controlled medications (including C-II through C-IV), not just opioid analgesics, because of a political trade-off that expanded exemptions for treating chronic pain to include hospice and palliative medicine physicians. This subtle change in legislative language eluded many in the healthcare environment, until just before the planned implementation of the new law, causing anxiety for many Florida physicians and patients concerned about maintaining access to controlled medications. In light of this anxiety about the potential impact of the new law on both patients and physicians, we initiated a quality improvement (QI) project to characterize its effects and identify opportunities to improve palliative care in the setting of implementation of the new law. In our outpatient palliative medicine clinic (PMC), we began recording results of all E-FORSCE queries occurring after the law’s implementation of July 1, 2018. We informed each patient that the PDMP query had become mandatory in Florida, and we discussed the results of each query with each patient. Each query examined the last 12 months of the patients’ controlled medication prescriptions. This article describes our experiences in the first month of experience with the new law, although we plan to examine queries for a total of three months before closing this QI project. For the purpose of this QI project, we have documented patients’ demographics, including each patient’s age, gender and limited identifying information, such as patient names and identification numbers; this data will be de-identified for any statistical analysis planned in the future. We also recorded patients’ main diagnosis and pain symptoms, the number of prescribers listed by the PDMP as well as the dose of the patient’s opioid analgesia, measured in average daily morphine milligram equivalents, as provided by the state database. We also noted pain ratings with and without medications, including opioids and non-opioids, as well as the difference between those ratings. We classified the numbers of each patient’s prescribers binarily (one prescriber or more than one prescriber), and usage sage patterns were classified ordinally as medically legitimate, aberrant or medically illegitimate. Medically legitimate patterns reflected 1) cross-coverage of medication renewals, 2) evolving sites of care (such as a transitioning into oncologic care after treatment of cancer pain before establishing a cancer diagnosis), 3) prescribing of non-opioid controlled medications by primary care physicians (PCPS) and/or their cross-coverage and 4) prescribing within the policies and rules of the PMC. We defined medically illegitimate patterns as involving 1) duplicative prescriptions (multiple prescriptions within close temporal proximity at multiple geographic site or multiple providers), 2) patterns unexplained by under-treatment and/or an inability to fill prescriptions in full quantity, or 3) behavior(s) prohibited by the policies and rules of the PMC. We used the category of aberrancy to describe situations which did not fall cleanly into the definitions of medically-legitimate or illegitimate usage. We also allowed for individualized comments regarding any unexpected or unusual findings when performing a PDMP query. The mean MME over the last 30 days was usually obtained from the PDMP, but was calculated based on prescribing instructions when not provided explicitly by that database. Finally, we recorded patients’ self-reported pain ratings based on a 0-10/10 scale, with 0 indicating no pain and 10 indicating excruciating pain (or the most severe pain the patient had ever experienced). 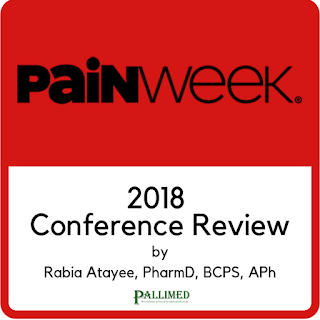 We recorded patients’ pain ratings with and without cancer pain medications, clarifying that we meant pain medications being prescribed medically for their cancer pain. In our clinic, the usual goal for cancer pain control is achieving a pain rating of 4-5 out of 10, not the achievement of a pain-free state, an approach that evolved from the American Pain Society’s recommendations for managing cancer pain. In the first month of our QI project, we queried the Florida PDMP for a total of 125 outpatients. Of these, 96% had cancer-related pain, while the rest had chronic pain related to other conditions for which they received outpatient palliative care, such as sickle cell disease (3 patients, 2.4% of total). The patients’ average age was 57.8 years old (range of 25 to 85) and 61.6% of them identified as female. Nine patients (7%) were new consultations to the PMC. About 73% of the patients had more than one prescriber listed in the PDMP, while 24% had a single prescriber for controlled medications. Only two patients (1.6%) exhibited aberrancy: one had a query showing 15 prescribers, and the other was a healthcare professional who had self-prescribed renewals of anxiolytic medications (which is considered unethical, but not illegal in Florida). The patient with 15 prescribers was ultimately not found to be using opioids illegitimately, but rather was participating in the healthcare system in a fragmented way, through two, parallel sets of third-party payers (health insurance and motor vehicle insurance). Notably, there were no patients whose prescribing pattern suggested medically-illegitimate behavior, such as “doctor shopping.” More importantly – and somewhat concerning – we uncovered four cases in which the state PDMP was demonstrably incorrect, which would reflect an error rate of 3.2% in the database. This included two cases in which prescriptions written in the PMC were attributed to non-prescribing providers at outside locations. Two other patients had filled prescriptions for controlled pain medications, but did not appear in the PDMP at all. An additional patient was not located initially, but found under her maiden name after further investigation (and not considered a PDMP error). The mean opioid analgesic dose for all of the patients was 210 MME per day, but the median dose was 100 MME per day, with a very wide range of daily dosages (6 MME to 1300 MME; Std. Dev. = 265.2). The distribution of Daily MME is shown in Table 1 (below). Three patients had received opioid analgesics within the last year, but were no longer taking them at the time of the PDMP query. The patients’ mean pain rating without taking any pain medications was 8.5 out of 10 (SD = 1.1, Median = 8.5). The patient’s mean pain rating when taking their prescribed cancer pain medications was 3.8 out of 10 (SD 1.5, Median = 3.5), with an average reduction in pain rating was 5.0 points (SD = 1.5, Median = 5.0). This represented an average in reduction in pain of 56.4% with usage of the prescribed regimen. We were surprised that almost three-quarters of outpatients in a palliative medicine clinic (PMC) housed within a regional cancer center had PDMP queries that showed multiple prescribers for their controlled medications. Each patient who receives palliative care in our PMC receives written educational material describing the policies and procedures of the clinic, including a directive encouraging them to receive prescriptions for controlled pain medications from a single prescriber and use a single pharmacy to fill them. 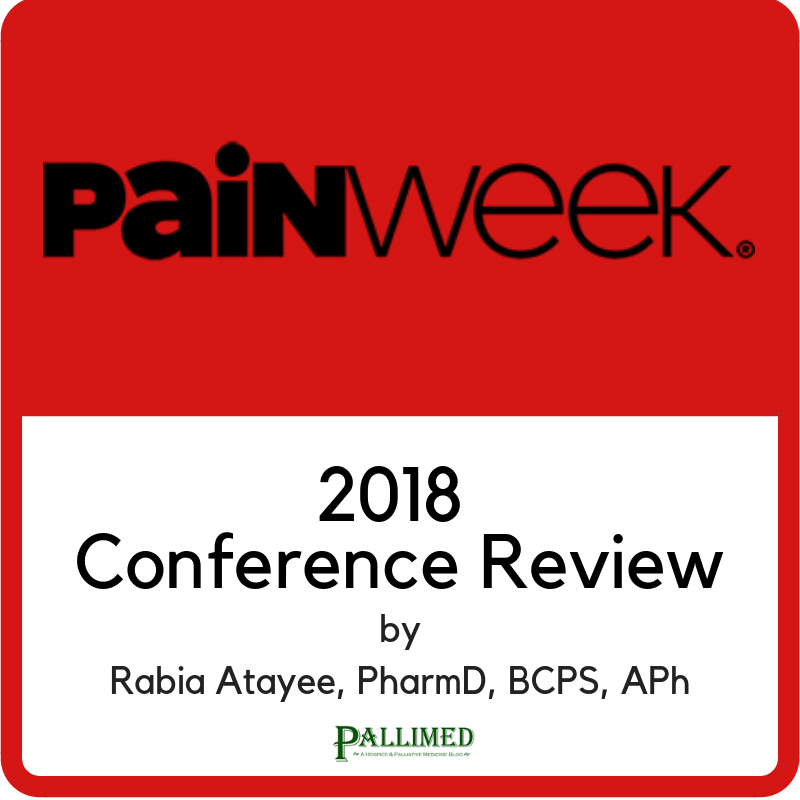 On the other hand, deeper examination of each PDMP report revealed that the vast majority of the patients were taking controlled medications in a medically legitimate way, with only two patients exhibiting medication aberrancy and no patients demonstrating medically inappropriate behavior. Florida Governor Rick Scott introduced the concept of mandatory physician queries of the PDMP to “combat opioid abuse in our state”, implying that queries might uncover inappropriate patient behavior, although the law ultimately does not advise physicians how to proceed after performing a mandated query. Additionally, some physicians have suggested that the presence as multiple prescribers in a PDMP should serve as a red flag for doctor shopping, a form of medically inappropriate patient behavior. Based on this QI project and our prior work, we are concerned that applying that using multiple prescribers as a red-flag PDMP strategy could worsen opioid stigma and difficulty filling cancer pain medications in our patient population. We were also surprised – and disturbed – to find that our estimation of the error rate within the Florida PDMP (3.2%) exceeded the rate at which we identified medication aberrancy and medically inappropriate behaviors (1.6% and 0%, respectively) in our patient population. This calls into question the accuracy and usefulness of the PDMP as a tool to “combat opioid abuse,” at least in outpatients receiving palliative care at a regional cancer center. Of note, we took into account the lag time between when patients fill their prescriptions, at which time the pharmacy submits its record of that transaction to the PDMP, and the time that it takes for the PDMP to post the information to the database for review by prescribers, allowing for a 90-day lag in cases of missing prescriptions. Opioid dosing varied widely in our project, with 46% of patients using doses of less than 90 MME daily and 28% using doses higher than 200 MME per day. In light of the proposed rules for opioid prescribing for 2019 by the Centers for Medicaid and Medicare Service, we anticipate that about one-quarter of patients receiving prescriptions for controlled cancer pain medications will face procedural hurdles, most likely in the form of health insurance prior authorizations (PAs) , when they attempt to fill those prescriptions beginning on January 1, 2019. It also means that pharmacists will need to contact prescribing physicians for another one-quarter of prescriptions issued to patients with cancer pain, as mandated by the CMSA Proposed Opioid Rules. Given the large number of American patients affected by cancer pain, the regulatory burden upon physicians and pharmacist should prove to be substantial. In turn, this is likely to create more difficulty for cancer patients and their families to access pain medications that many need to preserve their quality of life. 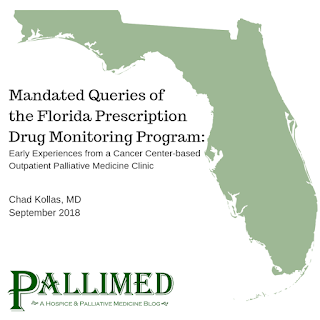 Finally, it is uncertain from our project whether Florida’s mandatory PDMP queries will lead to reduced prescribing of opioids, as has been the case in other states [see Suffoleto et al. J. of Pain, April 2018; 19(4):430-8]. What is clear, however, is that state-mandated PDMP queries have not led to reductions in opioid overdose deaths, a main goal cited by politicians when justifying their passage from legislation into law. Instead of prescription opioids, illicit fentanyl and heroin have become the drivers of opioid overdose deaths. In light of what we have learned in the QI project, this leads us to ask this critical question: Is physicians’ time best spent querying a database with a higher error rate than the rate at which it identifies medically inappropriate behavior and which might lead to worsening opioid stigma and difficulty filling prescriptions for cancer pain medications? Perhaps will be able to answer this question even more forcefully as we complete this project in the months to come. Dr. Kollas has provided outpatient palliative care at Orlando Health UFHealth Cancer Center for over 17 years. He first wrote about his personal experiences with chronic illness and pain in a 1997 article in the “On Being a Patient” series in Annals of Internal Medicine. You can find him on Twitter at @ChadDKollas. My first day of medical school, I asked the Dean how to start a Hospice and Palliative Medicine Student Interest Group (SIG). Before I became a medical student, I began volunteering for hospice. It changed my life. I learned invaluable lessons about life, death, and healing throughout my nearly five years as a hospice volunteer and I realized these lessons would not be taught in a classroom. Three years into medical school, we are one of the most active groups on campus, and we continue to grow. Assembling the group was not as difficult as one might think. 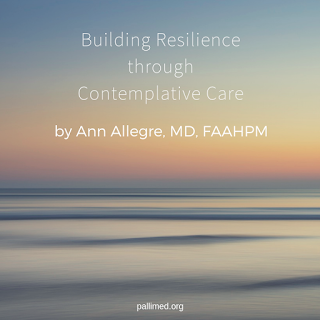 The biggest hurdle is many students simply don’t realize this is something they should know about, and because HPM is a blind spot for faculty as well, it gets left out of an impacted curriculum. How and when are students supposed to learn about these things if there is no time or place for them? In our case, it came down to a spark of initiative, which caught on with persistence. 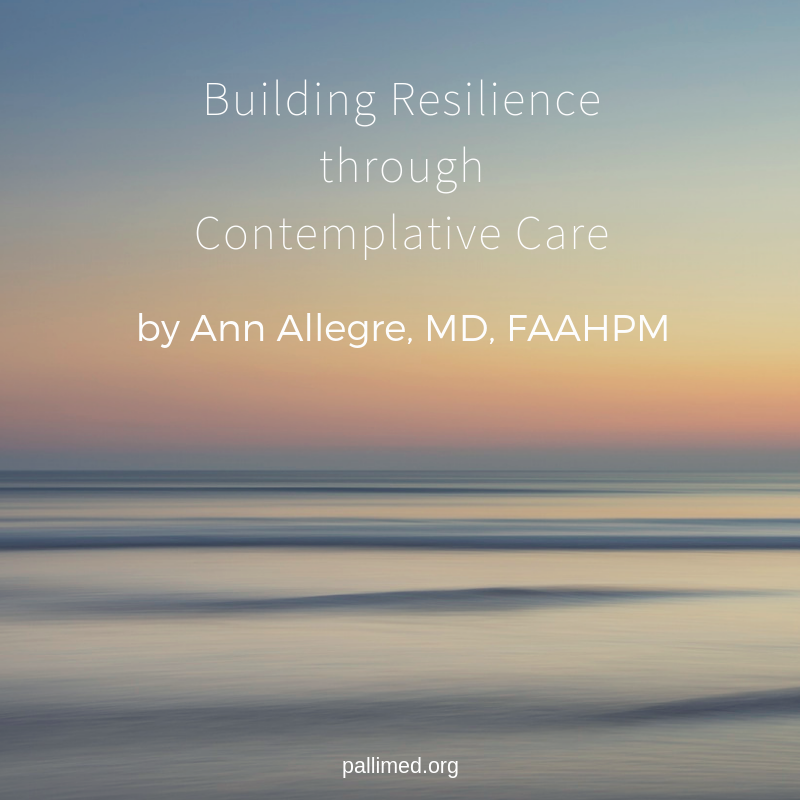 As a medical student with hospice experience, I understood the anxieties my peers might have when it came to caring for people who are very sick or terminally ill. Clearly, the majority of my classmates were not aiming for careers in hospice or palliative medicine, but there are many specialties which can be enhanced with early exposure to HPM. At least once a month, our group meets to discuss topics such as grief and loss, advance care planning, and death with dignity. 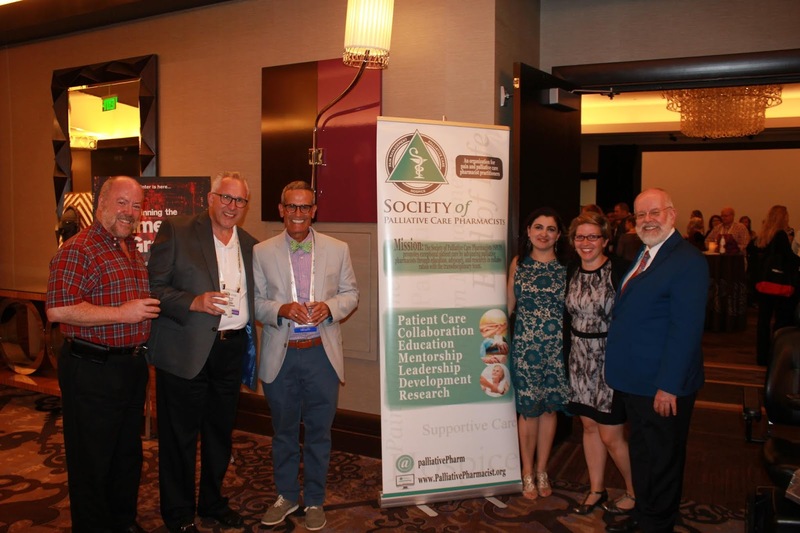 We’ve teamed up with other interest groups to broaden our audience, and have held “cross-talks” with our emergency medicine, internal medicine, and oncology interest groups. Our next meeting is a triple cross-talk with surgery and oncology. When we meet, it not only introduces the topic of palliative medicine to a group of students who have likely never heard of it, but also allows them to discover for themselves why this is something they should know about, and something they will likely use in some capacity in their specialty of choice. Though these talks are invaluable, I know from firsthand experience that some of HPMs most powerful lessons are learned at the bedside. I have been working with local hospices to find a way to get students trained as hospice volunteers. Though it is difficult to motivate the majority of medical students to do anything other than study, many of us crave interaction with the human side of medicine, and jump at the chance. When I was a volunteer, we had to commit to four hours a week minimum. Because this is not possible for medical students, flexibility from the hospice is key. The HPM SIG also serves as a springboard for research, which is another opportunity for students to directly engage with the field, and maybe meet a mentor along the way. Our University does not have an affiliated hospital, but we have been involved with research projects done by our neighbor UC Davis’ fellows, and a few from other local physicians as well. Importantly, this group costs nothing, only time, effort, and lots of e-mails. It is a passion project that would not exist without nurses, social workers, and physicians volunteering their time to come speak to us. Despite the minimal cost of running such a group, very few exist in medical schools. It is no secret that there is a scarcity of hospice and palliative physicians, and that dearth will only become more apparent as our population ages. Student interest groups have the potential to not only recruit future hospice and palliative physicians, but also to educate their colleagues in training on what hospice and palliative medicine is, and when to use it. At the end of our M2 year, a lecturer said something along the lines of “palliative medicine is only for the terminally ill,” after which dozens of my classmates’ heads snapped back in my direction, recognizing the error. I could have burst with pride. 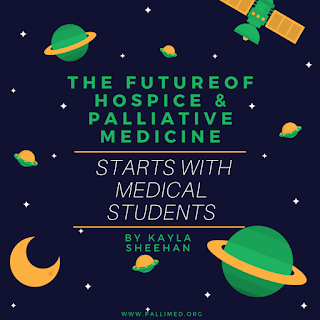 When we graduate, I may be the only one headed for HPM, but 90 physicians will be going into the world with at least some knowledge of what hospice is, what palliative medicine is, how they overlap and differ. It may not singlehandedly solve the HPM physician shortage, but it is a step in the right direction. Does your local medical school have an HPM SIG? If yes, add it to the comments, and share what you have been doing with it. If no, what are you waiting for? 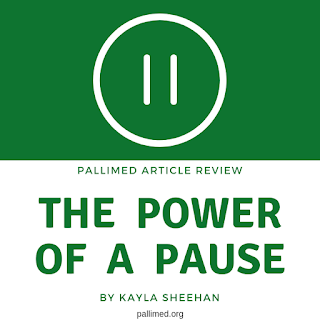 Regular Pallimed readers will remember Amy Davis’ excellent post regarding CMS’ recent proposed rule updating the Medicare Physician Fee Schedule and Quality Payment Program for 2019. (See this CMS Fact Sheet to learn more). In this rule, the agency proposes historically bold changes to outpatient evaluation and management (E/M) documentation requirements and payments, among many other substantial changes in the fee-for-service Medicare program. 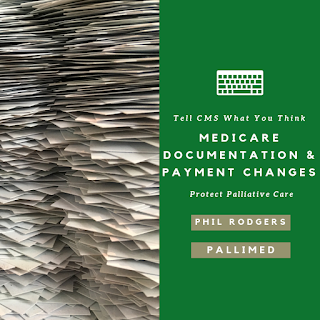 CMS says these proposed changes are designed to "increase the amount of time that doctors and other clinicians can spend with their patients by reducing the burden of paperwork that clinicians face when billing Medicare,” and they align with CMS’ Patients Over Paperwork initiative. One of the provisions most concerning to the hospice and palliative care community is the proposal to create a single ‘blended’ payment for level 2 through 5 outpatient E/M visits (both new and established) that is lower than the current payment for level 4 visits. (See a CMS slide deck for more detail). Since many outpatient palliative care providers bill almost exclusively level 4 and 5 visits, this proposal is particularly damaging to our field. 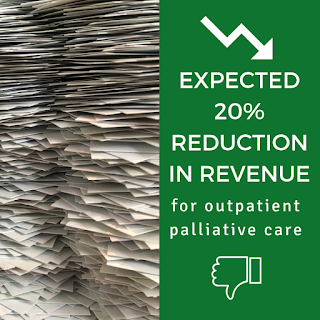 In fact, an American Medical Association (AMA) impact analysis showed that hospice and palliative care providers will be the hardest hit of all specialties, with an expected 20% reduction in outpatient E/M revenue. CMS also proposes new complexity and prolonged services payments, but they will not be sufficient to offset the cut in E/M payments. On the positive side, the rule also includes proposals to reduce physician burden, like significantly decreasing documentation requirements (or 'note bloat'), and providing options to bill based primarily on ‘medical decision making’ or even face-to-face time. CMS also proposes new payments for technology-based services (both patient interactions and interprofessional consultation), new payments for E/M services provided on the same day by different providers in the same specialty or practice, and eliminating the requirement to justify a home visit instead of an office visit. The reaction from the medical community to this proposed rule has been swift and significant. The AMA gathered 170 state and specialty medical societies and other health professional organizations to sign on to a letter that encourages CMS to move ahead with the positive changes in the proposed rule, but not to finalize the ‘code collapse’ proposals as written. Instead, the signatories request that CMS work with the medical community to develop payment reforms that ‘get it right’ for patients and providers, for implementation as soon as 2020. 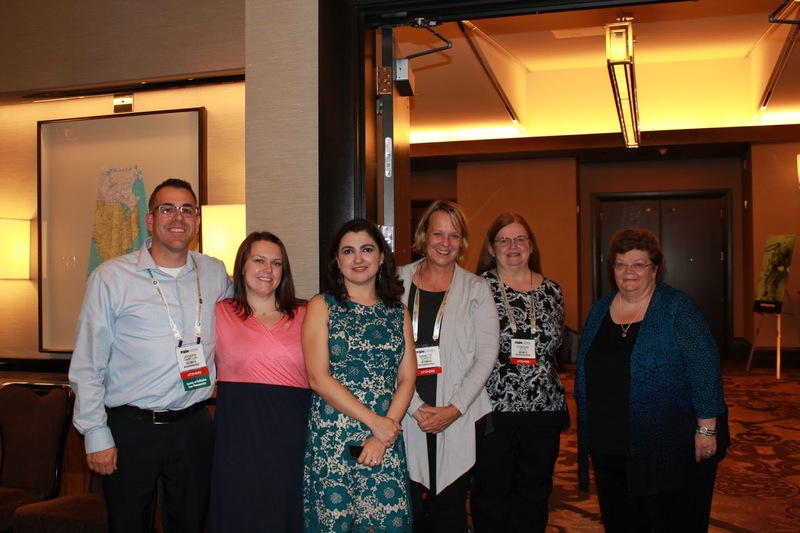 The American Academy of Hospice and Palliative Medicine (AAHPM) has been actively engaged since the release of the proposed rule in mid-July. In addition to signing on to the AMA letter, AAHPM has worked with the National Coalition for Hospice and Palliative Care, the Patient Quality of Life Coalition, and a multi-specialty coalition led by the American Geriatrics Society, as well as participated in meetings with CMS leadership and a high-profile E/M workgroup convened by the AMA Current Procedural Terminology (CPT) Editorial Panel and RVS Update Committee (RUC). AAHPM has stressed throughout that many outpatient palliative care providers will be severely affected by the E/M payment reductions to the point of being forced to close, and that the proposed changes will likely reduce access to care for many Medicare beneficiaries with serious illness. AAHPM has also has pledged to continue very active engagement to help develop more patient-centered payment proposals. Now it’s your turn! Public comments are being accepted through midnight (Eastern time) Monday September 10, and I strongly urge you to weigh in. It’s easier than you may think: AAHPM has provided a short and readable guide that provides suggested Talking Points and details how to submit comments online. Do check it out. You can also review these tips for effective comments from Regulations.Gov. 1. CMS really does read every comment received on proposed rules, and sometimes cites specific comments as leading to changes in the final regulations — so your input counts! 2. 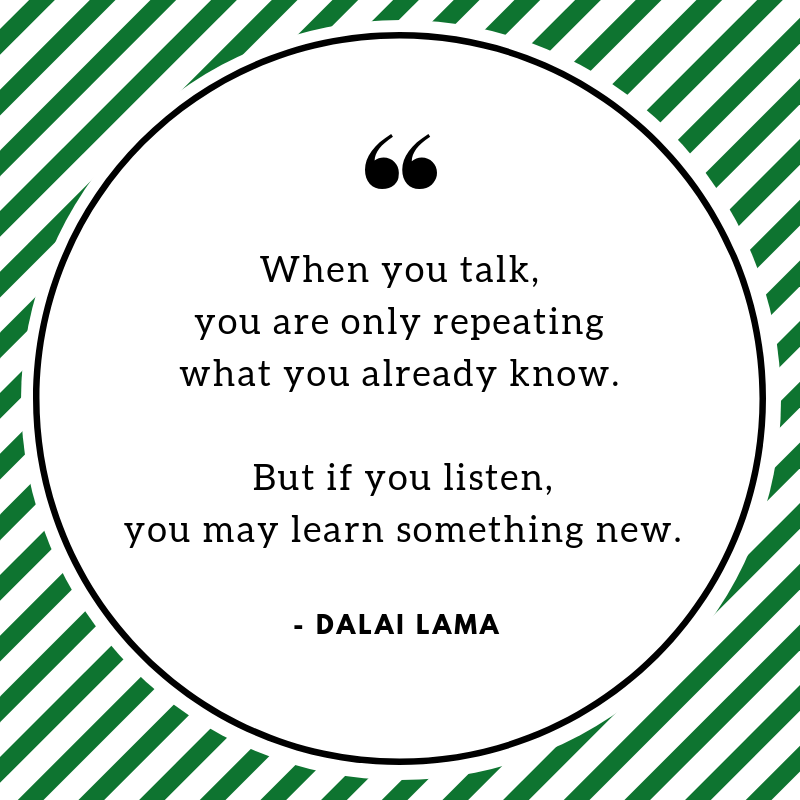 Write in your own voice, and speak to the impact the proposals will have on your practice and your patients. 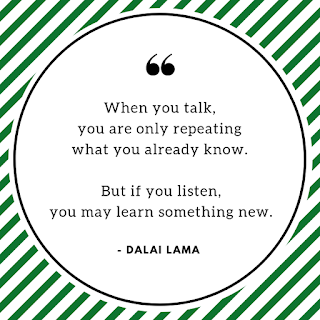 If you happen to have specific knowledge about regulations (say, from a leadership or administrative role) don’t be afraid to share it; however, you don’t need to be an ‘expert’ (or try to write like one) to weigh-in effectively. 3. Don’t feel like you have to comment on every issue in the proposed rule (it’s massive). Focus on those that you feel most strongly about. Sometimes a shorter, well-reasoned and well-supported comment packs a bigger punch. Deadline is Monday, September 10, at 11:59 PM ET! Phil Rodgers practices and teaches Palliative Medicine and Family Medicine at the University of Michigan, and directs UM Adult Palliative Medicine clinical programs. He also represents the American Academy of Hospice and Palliative Medicine (AAHPM) in multiple national advocacy efforts related to payment and policy, and is leading the Academy team developing strategy, comments and collaboration in response the 2019 MPFS proposed rule. I’m sure many, if not most health professionals who have spent time around an oncology unit have encountered patients receiving care in the late stages of their disease and had the thought, “Is this really helping?” Or possibly, “Has anyone asked this patient how they feel about this treatment?” As a palliative medicine physician, it feels like having these conversations have become a cornerstone to the type of care I provide. Knowing palliative care is a relatively young field, the number of cancer patients is increasing, and that those patients on the whole are living longer with their diseases, it becomes clear palliative care clinicians will need help in having these conversations. Furthermore, a dedicated effort to document these conversations will be imperative to communicate those wishes to all of the patient’s healthcare providers. This quality improvement study indicates help might not be as far away as it might seem. What the study calls a “lay health worker” (LHW) was one individual with a BA degree currently doing a part time health education program. That person received additional training in the form of online training modules, as well as shadowing the institution’s palliative care team. Once trained, the LHW performed five tasks under the supervision of a registered nurse. 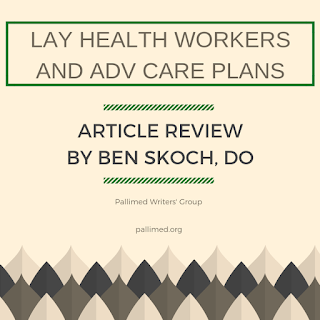 The LHW provided the intervention group of patients with education on goals-of-care principles, establishing care preferences, identifying a surrogate decision maker, filing an advance directive, and encouraging patients to discuss care preferences with providers. A part-time, blinded study was conducted at a single center, a VA medical system in California. Patients had either newly diagnosed stage III or IV solid tumors, or recurrent disease. The two groups were divided into an intervention arm (where they worked with their oncology team in addition to the LHW) and a usual care arm (oncology team alone), with over 100 patients in each arm. It is important to note 99% of the patients in this study were men, 77% of whom were Caucasian. The primary objective was simply to see if the system could increase documentation of patient wishes and goals of care in late stage cancer. The usual care group had 17.6% and 24.1% goals of care documentation at 6 and 15 months post-randomization, while the intervention group had 92.4% and 93.3% at the same checkpoints. An advance directive was documented 25.9% and 33.3% of the time for usual care, and 67.6% and 74.3% in the intervention group. Secondary outcomes showed higher patient satisfaction, low emergency department utilization within 30 days of death, lower hospitalization rates within 30 days of death, higher hospice utilizations within 30 days of death, and decreased overall healthcare costs within 30 days of death in the intervention arm. And all of them were statistically significant. The authors point out cost savings did not translate to the groups when examined at 15 months post-randomization. Interestingly, mortality rates among the two groups were nearly identical (57.1% for intervention and 55.5% for control). Some might expect the control group who utilized hospice at a higher rate within the last thirty days of life would have a significantly higher mortality rate, but this was not the case. The knee-jerk reaction to this study is, “Let’s get a lay health worker trained!” It’s especially appealing when it was described that implementation costs (about $20,000) paled in comparison to rough estimates of net savings for the health care system (about $3 MILLION). It seems to me that this would be a legitimate feeling, especially considering that palliative care usage did not differ among the two groups. In other words, this LHW was able to locate people who did not need specialized palliative care to have these conversations, they simply needed someone to have them with. So often it is cited clinicians don’t have enough time during a regular patient visit, or think they have more time in the future to address these issues. That is, until often it becomes too late for a person to make their wishes known. Maybe this intervention really could be a game changer moving into the future of health care. But before you go singing this from the mountain tops, I’d caution you to practice a healthy sense of skepticism. As was stated, the study population was fairly uniform (mostly white men in the VA system in California). A repeat of this study across hospital systems in other geographic locations would be extremely helpful to see if the results are reproducible and generalizable. But at the very least, I hope this helps spread the message that people might be more ready than physicians think to have goals of care and advance care planning conversations. Perhaps we just need to ask more. Ben Skoch, DO, MBA, a Hospice and Palliative Medicine physician at the University of Kansas Medical Center. Outside of Family Medicine and Palliative Medicine, he enjoys most sports, black coffee, and most especially spending time with his wife and two adorable children. More posts from Ben Skoch here. 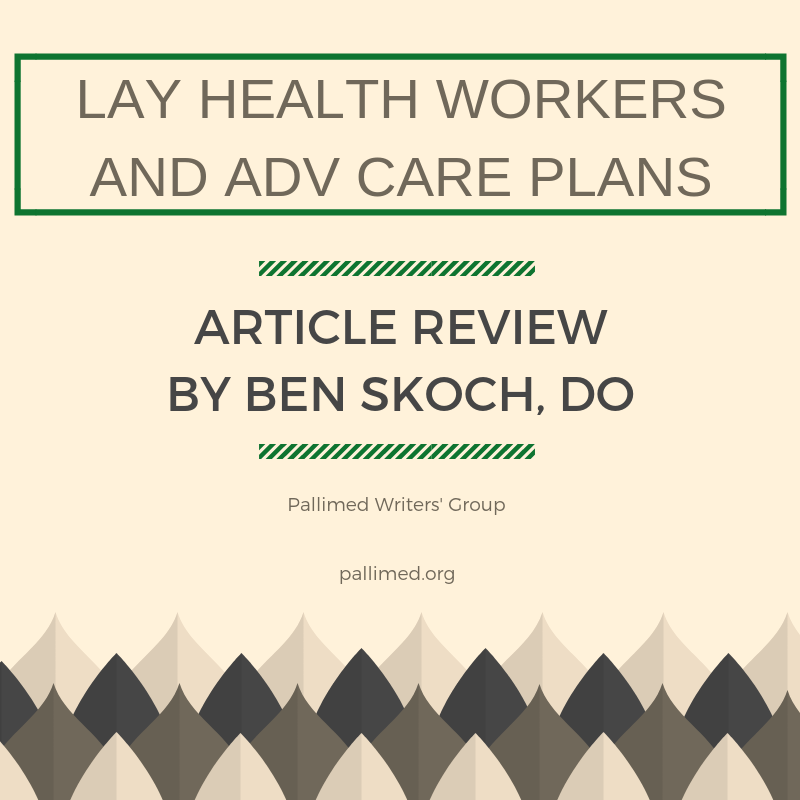 More Pallimed posts about advance care planning can be found here.